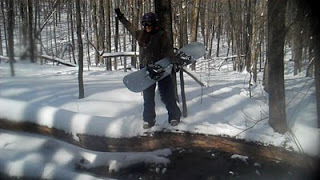 It was the last Burton Demo day at Hunter so the Gypsy and I decided to demo a board we would never own. the Method is Burton's $1,500 snowboard (yeah, there's a $1,500 snowboard- shake head in shame). It's a directional with an Alumafly core (looks like an aluminum honey comb, makes it über light, big no for rails). It's got carbon i-beam and fiberglass. It has UltraMeth Construction which I think means that they smoke Meth while they think up prices. He gave the Gypsy a 156 and me a 160. The Gypsy rides a 149 and I ride a 156; we decided to go big. Attitash, Waterville Valley, Ragged Mountain, Wachusett (need to be wearing Green), Mt. Snow, Sugarbush, Wildcat Mountain, Jiminy Peak. Stowe does a $39 ticket.